On our recent bus trip to Bend, we learned that we were supposed to have the Bromptons packed in some sort of box or bag. It’s a halfway reasonable request, but one which we knew nothing about until we were actually boarding the bus. The very limited website said nothing about bicycles. The person on the other end of the phone number I found to call for questions said, rather nonchalantly, that they just bring all bicycles on board. The station agent, when we purchased the tickets and then checked in the next day, said nothing about the bag/box requirement. Which led me to once again grumble internally and grit my teeth through a forced smile, as I tried to talk my way on to the driver’s good side by copping the ‘I’m sorry, I didn’t know’ defense. As it turns out, we were also supposed to have paid a $15 bicycle fee. This we don’t learn until a week later, when we had purchased our return tickets, leaving Bend. I asked about folding bikes, thinking that, surely, common sense would kick in and the Bromptons would be exempt from the fee. Nope, she tells me, those are $15 too. Which leads me to wonder why. By their very own luggage policy, a passenger is allowed to check one bag, provided that it is under 50 pounds and isn’t oversize. 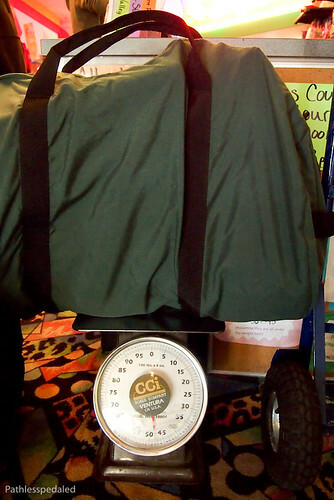 So, if our Bromptons fit in a bag that is within the size and weight restrictions, why is there an the extra fee? In the US, there seems to be an ingrained prejudice against bicycles, especially when it comes to taking them aboard some sort of transit system, and even more especially when it comes to long-distance bus systems. To be fair, a regular-size bike can be bulky and unwieldy and require a large amount of space. But so can a baby stroller. And those suitcases that are four feet tall. The reasons why a bicycle, specifically, should be subject to extra fees are nonsensical and illogical. 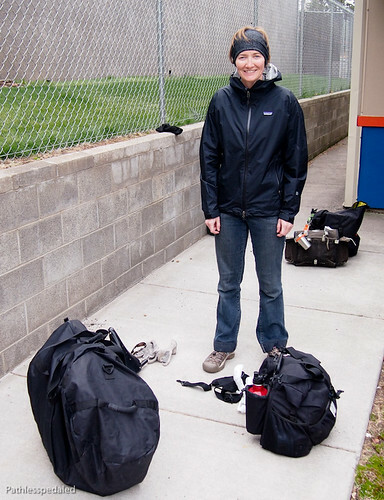 And they’re even more absurd when the bicycle-in-question fits inside a rather standard-size duffel. Contrast this with our experiences taking The Wave bus between Portland and Tillamook, OR. The Wave is the same small size/style vehicle as the bus to Bend, yet our bikes were cheerfully welcomed each of the three times we traveled on The Wave. With racks on the front and a large luggage compartment, it’s so easy and enjoyable to take a bicycle with you on The Wave that we’ve seen upwards of seven cyclists onboard at one time. No muss, no fuss, no fee… just an example of a long-distance bus system that gets it. Which also leads me to wonder why there’s such variance in bike policies? Why is it such a guessing game to figure out how to take along a bicycle? And why do you inevitably feel like you’re doing something wrong? I think it comes down to one very simple answer: Long-distance bus systems have not yet become aware of the fact that bicycles are now a part of the everyday equation. Yes, people, it’s time to recognize that, whatever your personal feelings, your patrons might want to take a bicycle with them. They want it to be a simple, straight-forward process. They want reasonable policies that are laid out in advance and easy to find. They want the bus driver and the customer service agent and the woman behind the counter to all understand said policies in exactly the same way. And here’s the clincher: They want to feel like their bicycle is welcome, because then they will use your bus again and again and tell their friends to do so also. Which isn’t to say that bicycle-toting patrons are unreasonable. Set a limit to the number of bicycles your bus can carry. Require patrons to reserve a bike space (and make sure to tell them how). These are policies that are already in place in a lot of train systems. And I’d hazard a guess that cyclists would be perfectly fine with these limits, because it’s obvious that you’re open and willing and trying to accommodate your customers. Right now, there is a lot of unnecessary indignity that faces someone trying to take a bicycle aboard a long-distance bus. We have all flubbed the truth and slipped through the grey areas, heart pumping way too fast, in order to get past the pointless red flag that pops up at the mere mention of the word ‘bicycle.’ Most of us would be happily willing to be law-abiding bus-riding citizens, if we didn’t feel like common sense had completely broken down and we were being unreasonably targeted. So, we hereby issue a challenge to all long-distance bus systems… Sit down and craft a reasonable, non-discriminatory policy that allows your patrons to take bicycles aboard. Then let us know. Bummer that you got tagged with the fee. Have similar experiences with full sized bikes on Amtrak. No fee one way and then a hard case employee hell-bent on charging a fee on the return. My experience with Brompton, at least on an airplane is: it’s only a bike if I call it a bike, especially if it’s in a bag and under the dimensional and weight requirements. Too bad ‘the Dog’ doesnt get it. Although I think this a great PR opportunity for them to embrace bikes and engage multiple-modal tourists to their services. 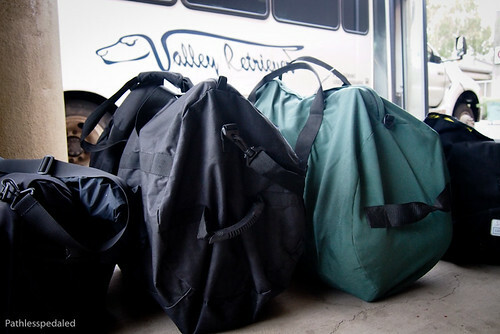 Your duffle-bags look good and strong, but aren’t they rather heavy and bulky to carry once you reach your destination? About 30 year ago I rode across Canada and at one point decided to take the train for a section of the journey. Nothing could have been easier. the train had a special baggage car which had hooks in it where I merely handed the bike to the baggage handler who hooked it on. Years later I tried to repeat the process. No baggage car, no handler, no way to take the bike on the train at all. I ended up getting it on to a bus but only after getting it boxed which required partial dis-assembly and paying a fee. The RR said the baggage car and handler had to be let go for economic reasons of course now they never get me as a passenger. I suppose if the RR lets go all staff and all cars it will be so efficient it’ll make a fortune. You are telling the truth AND avoiding a fee if you call it EXERCISE EQUIPMENT. bromptons are pretty unique in folding to suitcase size with greasy parts on the inside, and no major pokey/delicate protrusions. meaning that they are uniquely “good citizens” in crowded transit situations, even without a bag or box. but this puts carriers in the awkward position of appearing to endorse a specific brand, discriminating against more popular (cheaper) ‘uns. so instead they make rules about all folding bikes, which in some cases can be nearly as cumbersome as non-foldies, and well… brompton pays for the sins of other brands. I, too, have used that Bend/PDX bus and got grief at both ends for the Brompton, despite its being in the bike cover Brompton sells. I didn’t get hit with the extra fee, at least. Despite the bike being well within the company luggage size and weight policy, the drivers seemed to be annoyed at the awkward shape of the package, even after I showed them the easy way to lift, by the exposed saddle. I tipped heavily hoping for less grief next time, but now find myself inclined to just drive instead. Sad. Amtrak, on the other hand, could not have been easier or more accomodating, kudos to them. So true,but isn’t it fun sneaking the Bromptons in places?I got the Brompton cover recently,real fun!Like yourself,I have squeaked it thru hand luggage scanners,past doormen,into Shinto shrines ad infinitum.Teehee! Down here the OCTA has a double bike rack, works great with a bike that has 26in wheels. My Safari is 700cc/29in so I use a twisty (Foam casing with a bendable metal center) to ensure the wheel stays in the rack. One day a bus with a older almost lost my bike because one side is actually open around the rear wheel. Lucky it did not fall because of my strap technique. OCTA has a DAHON promotion and accepts folding bikes w/o restriction. So there are real advantages in the OC for folding bikes on the OCTA bus system. Have you considered using the Brompton saddle bag and rain cover? Yes. We have a pair, but often are able enough to get it on without a hassle that we stopped carrying it. Oh well. Hit or miss sometimes. We tour with Bike Friday bicycles in a bag and at first had some hassle. Now when asked to declare what they are we just say “bicycle parts” and it has never been a problem again.